One of the most common and frequent discomforts with your baby is crying. Unfortunately many times it turns into a difficult day when there is no option to calm your baby immediately. When your baby cries from three in the morning until dawn, no matter how you love your little one, this will fill you with concern. You’ll want to provide peace and quiet, and a way to calm your baby, although you don’t know how. How to calm your baby when they’re crying? The first thing you should be clear about is that when your baby cries, they always have a reason, which makes it hard to calm them down. It all depends on the patience and the bond you have with your baby. Generally, when a baby cries, it usually means they need something or have a certain discomfort. The first thing we advise you to do when your baby is crying is to get in physical contact with them. Hold your baby to your chest, and rejoice. 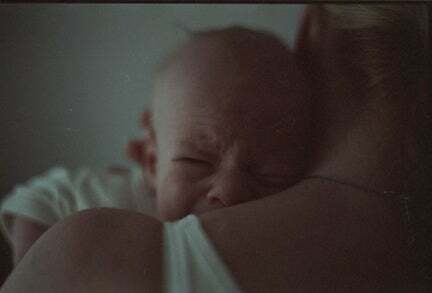 Your baby needs to know that you are there for him and can be protected when in your arms, despite the unpleasant feeling that is happening, and the reason they have to cry. Something that you should keep in mind before trying to calm them down, is that sometimes the movements that we do instinctively do not always work and can generate the opposite effect to what you expect. Many times, repeatedly moving your baby causes even more crying and desperation. This is because they don’t find joy when they are moving from one side to the other. Your baby will want tranquility and peace. When you bring your baby to your chest, make sure you are as still as possible. Your baby will feel despair at the beginning, but feeling close, sooner rather than later, will generate a bit of calm. Your caresses will increase their confidence in you; this will give you the opportunity to review them thoroughly, and find out why they started crying. Sudden games. When your baby feels close to you, and you begin to play an unexpected game with them, their concentration and attention will be immediately diverted to the action you perform at the moment, such as the movement of paper, or a game with sand, or other materials that can easily be molded and lower stress levels. Bubble bath. For babies, the bathroom is one of the most intimate and pleasant moments you can get to share with them. When they cry, and you can’t find a particular reason, give them a bath with mild aromatherapy scents, such as vanilla, so you will get them to relax and then sleep without difficulty. Outdoor walks. Take your baby out for a short walk in the open air. The many distractions that are outside will attract their attention and will decrease their interest in the episode of crying that they are going through. Sing. Your voice is one of the strongest connections you have with your baby. From inside the womb, they listen to you, and memorize your tone of voice and your special sound. When you can’t find a solution at hand, sing to them with a soft voice and all the love you feel for them, so that your baby feels protected and calm. The above tips will be very useful to help calm your baby if they are crying and you do not know how to reassure them. You must make sure that your little one is clean, that they have eaten well, that they are not thirsty and have no symptoms of any disease. Also keep in mind that like you, there are times when your baby needs crying to vent. A moment of emotion can also be the cause of tears and not necessarily serious, simply their parents must be there surrounding them with love and all the affection they require.